BEIJING, Sept. 6--Chinese President Xi Jinping on Thursday met with Gambian President Adama Barrow after the 2018 Beijing Summit of the Forum on China-Africa Cooperation (FOCAC) concluded Tuesday. 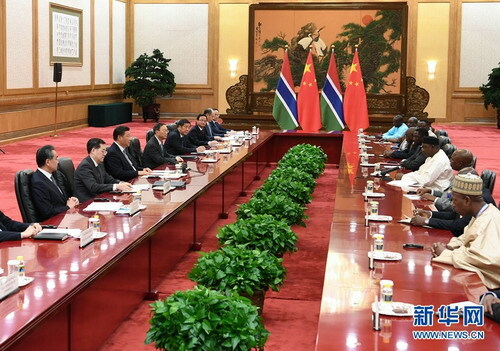 Xi welcomed the Gambian president's attendance at the FOCAC meetings for the first time, saying this is of great significance to China-Gambia relations, China-Africa relations, and the development of the FOCAC. In the two years since resuming diplomatic relations, the two countries have seen their friendship and cooperation move forward comprehensively and smoothly, and bilateral ties have developed positively and quickly, Xi said, adding that China is satisfied with the achievements made in the development of bilateral relations. China commends President Barrow and the Gambian government for adhering to the one-China principle, and is ready to work with the Gambia to continue steering bilateral ties in the right direction, continuously enhance political mutual trust, and continue firmly supporting each other on issues of core interests and major concerns, Xi said. China supports the Gambian government's efforts in "building the new Gambia," and is willing to increase pragmatic cooperation and expand people-to-people exchanges with the western African country, Xi said. China supports the Gambia's efforts to enhance peace and security capacity building, Xi said. For his part, Barrow said almost all heads of state and government of African countries attended the summit, a demonstration of the great importance they attach to China and China-Africa relations. It is with great pleasure that the Gambia has returned to the big family of Africa-China cooperation, and the Gambia is satisfied with the achievements the two countries have rapidly made after resuming diplomatic relations, Barrow said. "China has helped us improve our telecommunications, and road and transport conditions -- things that we had wanted to do for many years but failed," Barrow said. Facts have proved that it is a huge mistake for the Gambia to keep the so-called diplomatic relations with Taiwan, Barrow said. 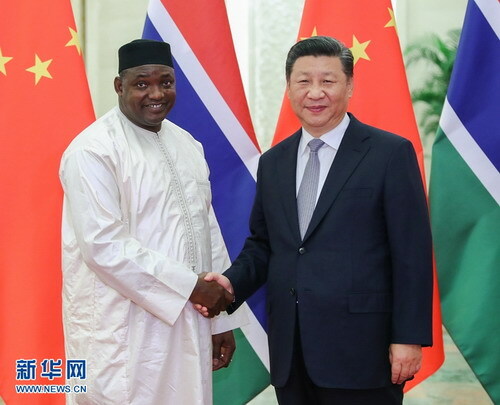 Barrow said his country will unswervingly uphold the one-China policy without any hesitation and is committed to consolidating the win-win partnership with China, which fully conforms to the will of the Gambian people, Barrow said. Barrow said he believes that cooperation with China will enable the Gambia to speed up its development.